Which Sectors Will Lower Interest Rates Help the Most? Heads of many companies had been demanding interest rate cuts from the RBI over the past few quarters. This is because the interest expenses were eating into their earnings. 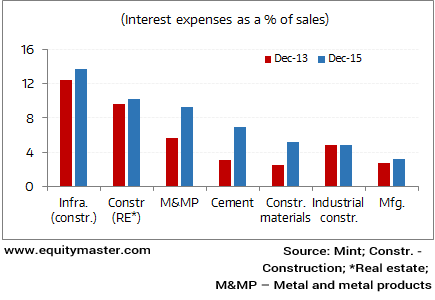 Today's chart of the day (sourced from the Mint) gives a good perspective on the sectors facing such problems. It also gives an indication of how the trend has changed over the past two years. From the chart above, you would notice that interest expenses have risen (as a percentage of net sales) despite rates coming down over this period. As the business daily has pointed out, this is more to do with a poor revenue show rather than companies taking on more debt. Two questions come to mind here. First, is whether this can improve soon. Given the overcapacity situation built-in for most of the core sectors, a drastic turn of events would be expecting a bit too much. Second is whether such capital intensive, debt reliant businesses should form part of one portfolio in the first place. There could be some good news on the interest rate front though. Ajit Dayal, our founder, has put forth some interesting arguments about why Rajan can get a bit adventurous and double the rate cut to 1%. As per Ajit, there are enough reasons to make such a cut possible. Equitymaster requests your view! Post a comment on "Which Sectors Will Lower Interest Rates Help the Most?". Click here!